You won't believe your eyes, or Sasha's pain tolerance, as you watch her perform these classic sideshow feats! Sasha is a Sideshow Performer who brings her painful talents to clients in Massachusetts, Connecticut, Rhode Island, New Hampshire, Vermont, Maine, and New York! She is also available to perform her sideshow acts outside of New England, and Internationally. Sasha performs several different sideshow acts. What is the human blockhead? Get ready to cringe as Sasha takes a 20 penny nail and HAMMERS it into her FACE! She also performs other related acts such as mental floss and painting. Some people make balloon animals. Sasha has a more impressive talent! She swallows the WHOLE 4 foot long balloon! Where does it go? Only one way to find out! A simple ladder. But instead of regular rungs, they are made out of real machetes! This painful act will leave you on the edge of your seat as Sasha steps up each sharp blade rung on her bare feet! Where does all Sasha's empty beer and liquor bottles go? Not to the recycling center! They get smashed and stored in a 5 gallon bucket and then poured onto the floor for Sasha to play with! Not only does Sasha walk on broken shards of glass, but you will see her piggy back a full grown man while walking on the glass as well as other painful surprises! We can't forget this classic act! Sasha has a bed made from 551 individual 4" long 20 penny nails! Not only does Sasha lay on this bed, but she then allows people to STAND on her! The holes left over in Sasha's body after are gut-wrenching! Yes, you read that right. Eating GLASS! A light bulb to be precise. And before you think this is some form of sugar glass, you'll watch her take it right out of a functioning lamp before munching away! Sasha adds another element of danger with these classes sideshow fire acts! 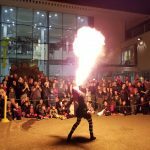 Not only does she light parts of her own body on FIRE, but she extinguishes fire eating torches in her mouth, and breathes giant towering plumes of fire!